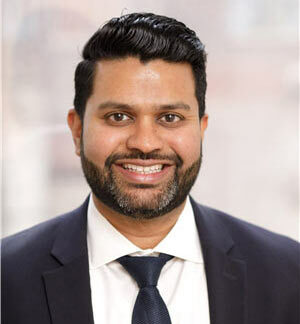 Pain management doctor in New York Dr. Febin Melepura is an Ivy League trained, top sport injury doctor and best rated pain management specialist in NYC who is highly specialized in treating any pain related issues – from back and neck to sports related injuries. As a best in class, top rated New York pain management doctor, Dr. Melepura provides highly personalized and comprehensive pain care in NYC. He is among the best pain relief doctors in the country. Dr Melepura offers the most effective sports pain management treatments available in the USA. Come see our brand new cutting edge, state-of-the-art sports injury and pain management clinic in NYC. NYC Sport injury specialist Dr. Melepura is board certified in Pain Management and Anesthesiology. He completed both his Interventional Pain Medicine fellowship and Anesthesiology residency at Columbia University Medical Center in New York City. Prior to his specialization in pain management, he received his Doctorate of Medicine (M.D.) at the nationally top ranked Stony Brook School of Medicine. Would you like to review Sports Injury & Pain Management Clinic of New York on Google? Please follow a link to leave your honest review. We value your feedback. 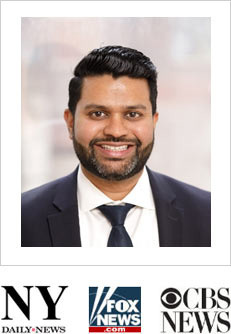 Do you have any questions for New York sports injury specialist Dr. Febin Melepura? Would like to schedule an appointment with the best rated pain management doctor in NYC Dr. Febin Melepura? Please contact our sports injury & pain management clinic of New York located in Midtown Manhattan NYC.